An important change notice for this product is available. 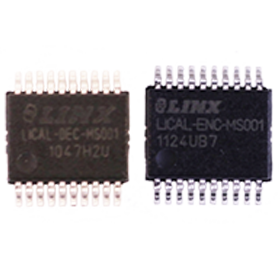 Trigger discrete actions with button presses or contact closures by using MS Series encoders and decoders with compatible Linx RF modules. The MS Series provides a medium level of security. It lets you send commands from multiple transmitters to distinct receivers in the same vicinity through digital addressing. It can be used with NT Series, LT Series, LR Series, LC Series, KH2 Series, ES Series and HP3 Series RF modules. For most applications, the MT Series transcoder provides better flexibility at a more cost-effective price. Consider using the MT Series for new designs. The encoder uses input from up to eight buttons or contact closures to encode a digital signal, then passes the signal to a transmitter for sending. A receiver picks up the signal and passes it to a decoder. If the signal is accepted, the decoder replicates the encoder’s inputs on its outputs. The outputs can be connected to up to eight devices such as microprocessors, LEDs, motors or relays. The decoder will only accept transmissions from compatible encoders with addresses that match its own. The MS Series has 16,777,216 (224) possible addresses, which makes accidental conflicts very unlikely. Addressing can be configured with button presses. The MS Series also sends the encoder ID, making it easy to allow or deny access to specific outputs based on which encoder is doing the sending. However, because the MS Series does not use encryption or rolling code, it does not protect against intentional security threats. For protection against intentional threats, consider the HS Series.